This morning an article caught my eye. It's not often that thermal imagers come up in the news, and especially when they are being used in new and interesting ways. Therms are commonly used by firefighters to find victims as well as "hot spots" where they need to put their attention. Insulation specialists commonly use therms to find where homes are leaking heat. 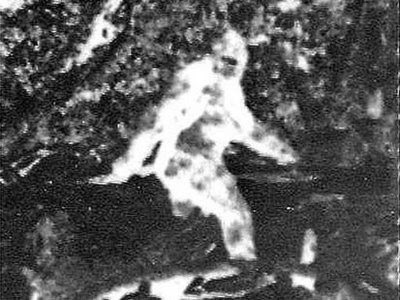 Bigfoot researchers use them to spot their warm-blooded quarry in the dark woods (well, I guess this is a little less common than the previous two uses). Now, airport security folks are using them to spot possible cases of swine flu. Enjoy the article, and click here to see samples of thermal imaging videos of various animals, including chimpanzees. might be a good place to start screening sasquatches for this flu. Taoyuan International Airport, in Taoyuan, Taiwan. To screen passengers for swine flu and other contagious diseases, some airports use thermal imaging cameras to see whether travelers have fevers, without having to stick thermometers in their mouths. So how do the cameras work? The devices are just like regular cameras, except that instead of recording light that objects reflect, these cameras are sensitive to heat. They can even work in the dark. Recordings from these cameras show up on video screens with hotter objects looking brighter. The systems are very sensitive, measuring temperatures down to a fraction of a degree Fahrenheit, said Andrew Sarangan, an associate professor in the University of Dayton's electro-optics program. Thermal cameras were rolled out during the SARS outbreak in 2002 and 2003, and airports in Singapore and China have been using them continuously since, said Alan Thomson, regional sales director at U.K.-based Irisys, a maker of thermal imaging devices. Now manufacturers say they've noticed an uptick in orders in recent days. "The phone hasn't stopped ringing," Thomson said. In Mexico, which already has 10 such cameras, the transportation secretary, Juan Molinar, said Thursday that 40 more were being bought for the country's eight largest airports. Of course, while the cameras can detect higher temperatures, they can't screen for swine flu itself. Someone running to catch a flight can have a higher body temperature, as can someone who's just had a drink. A fever also does not necessarily mean someone is sick with swine flu, so airports need to do further screening once they spot passengers with high temperatures. Irisys' cameras, which cost about $3,000, merge visual and thermal images to create a "heat picture" of a person. This image shows up on a screen on the back of the camera, much like the displays on consumer cameras. A pointer automatically shows the hottest area in the picture, which is usually a person's face, mainly because it's not covered in clothes. Tony Trunzo, senior vice president at Wilsonville, Ore.-based Flir Systems Inc., said his company has seen orders pick up not only from airports, but factory operators as well. Flir's cameras have improved significantly since the SARS outbreak, Trunzo said. The cameras have a higher resolution, for example. They've gotten cheaper, too, though the company's cameras still range between $10,000 and $15,000. Flir also has determined that it's best to screen one person at a time, instead of scanning a large crowd. Associated Press Writer Morgan Lee in Mexico City contributed to this report.